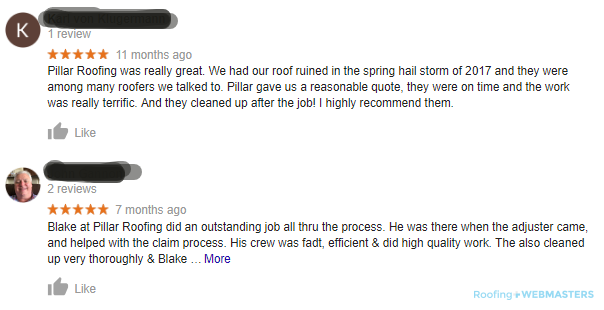 How Do Roofers Get Google Reviews? The first step is setting up your Google My Business account. Once it is set up and optimized you must ask customers to review you in person. This is typically done after you complete your roofing job. You can also in Roofing Webmasters SEO services which includes a native reviews widget embedded onto your custom website. This widget allows customers to leave Google reviews directly from your main site and also sends them text reminders. 84% of consumers trust online reviews as much or more so than a personal recommendation. Since roofing customers are inherently local their search results are tailored to a specific service area. The top ranking Maps listings often have the most Google reviews. After all, Google would prefer to display a company that has formed a reputation over time than one that is a virtual unknown. 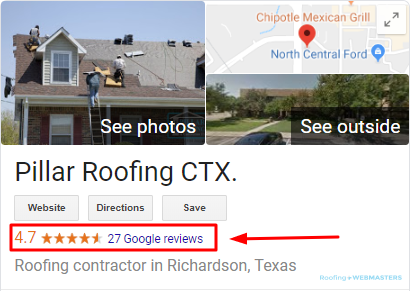 The more reviews a roofer has (as long as their mostly positive), the better chance they will have not only to rank on Google Maps and organic search results but to convert the users who come across their Google My Business or Maps. Customers leave feedback on various platforms like Yelp, Angie’s List, HomeAdvisor and Facebook. With that said, the most prominent review platform by far is Google. Because it is the foremost source of roofing leads, and the number one search engine in the world, it stands to reason that its published feedback would hold a bit more weight than other platforms. Since many of your future leads will originate from search queries, the presence of reviews, particularly positive ones, can really enhance your online presence. Google provides further information about reading and replying to reviews. The most successful businesses will still deal with bad feedback from time to time. As long as they are contrasted by an abundance of positive testimonials, they can’t have a significant impact on your reputation. It’s also important to treat bad reviews as a PR opportunity. When consumers research your company on Google, they will not only read through the reviews, but your responses to them as well. It is often the nature of the response that leaves the most lasting impression on the consumer. Updated on March 12, 2019 at 9:48 pm by Roofing Webmasters.